Please make a note in your diary for 8th December 2018. This is when our ambassador Tania Noakes will be giving a lecture to Cadets and Reservists about her recent expedition to Norway to support The Ulysses Trust. 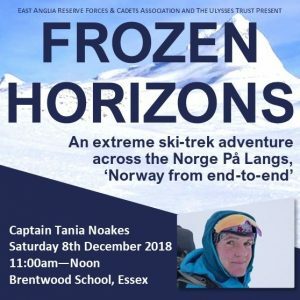 You are invited to a special event to hear Captain Tania Noakes talk about her latest expedition, the classic Norge På Langs, or ‘Norway from end-to-end’. Earlier this year, Tania skied over 2,500km in 82 days to become the first British woman to complete this epic ski route. Tania is an ambassador for The Ulysses Trust and made her challenging journey to raise awareness and funds for the Trust’s 25th Anniversary Appeal. Cadets and Reservists are invited to join Tania in what promises to be a thrilling occasion. Please note this is a FREE event, however all Cadets must be accompanied by and adult. You are requested to be in uniform.